It's that time of year again. Everybody has started screaming about #PSLs being available at that coffee chain that we keep supporting even though they don't pay their corporation taxes. I'm so over it. THERE'S NO PUMPKIN IN THE DAMN THINGS! It's pumpkin spice in the sense of 'spices that you might put into a pumpkin pie', not actual pumpkin-infused coffee drink. By the way, the almond extract is optional, but I have been tinkering about with my bottle of it ever since Fuss Free Helen turned me onto the stuff made by Steenberg's. I love the extra marzipanny depth it gives everything, but I know that not everyone is an almond lover, so you might just want the vanilla. Your choice. Pre-heat the oven to 180°C and grease a standard sized loaf pan. In a large bowl, or a stand mixer (which is what I used), mix the flour, sugar, baking powder, salt and spices. Add the butter and milk and mix until well combined. Beat for two minutes. Add the egg whites and extracts and beat until smooth (about another minute). Scrape into the prepared tin and bake for about 45 minutes. Rest for ten minutes in the pan and then turn out onto a wire rack to finish cooling. Delicious Delicious Delicious received three samples of extracts from Steenberg's Organic. No money changed hands, and my opinions are, as always, my own. Yes, pumpkin spice is misleading! Recently made a pumpkin and pecan loaf over at cakeyboi with actual pumpkin. Worth adding to recipes for the moistness it adds - if you can get hold of it that is!! 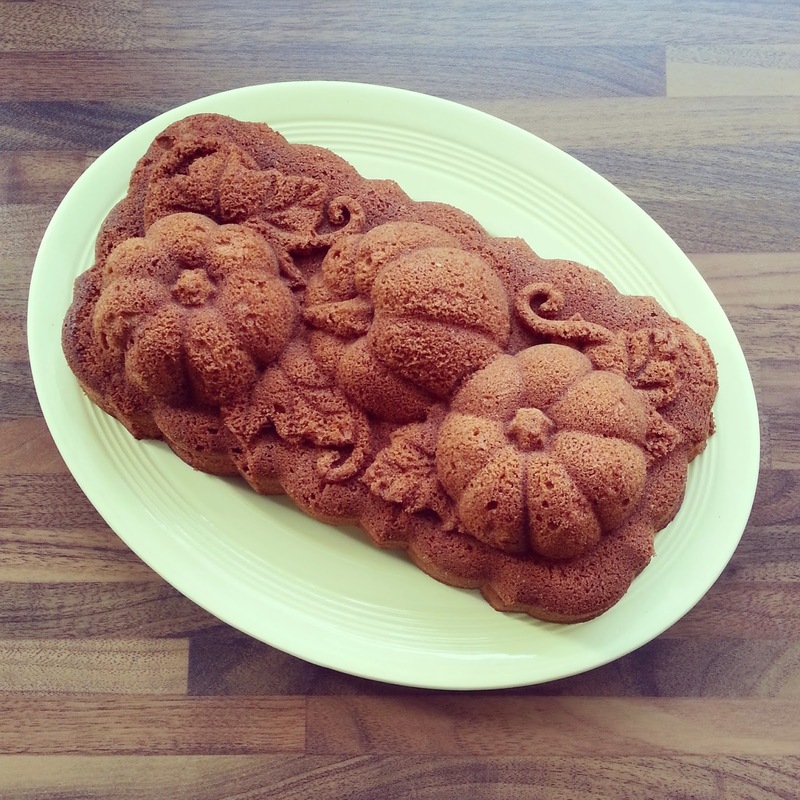 Fabulous autumnal cake! This name thing is like Coffee Cake in Denmark which has no coffee in it but meant to be eaten with a cup of coffee! I love the Steenbergs Almond essence as anything that makes my cakes taste a bit like marzipan is a massive bonus for me. Love the pumpkin tin - I don't have any fun tins like that! I have it on good authority that you can get almost anything in Dubai. Maybe my friends are telling porkies! Love Steenberg's though. Great stuff. That is because pumpkins are better than carrots. Am I right or am I right? I am obsessed with everything pumpkin at the moment. This sound delicious! You need to go shopping with Camilla then and get a pumpkin pan. Feed the obsession! Haha I'm confused about the pumpkin spice latte thing too. This cake looks great - love the mould! Percy actually drinks them btw. I think they're yucky! How sneaky, but it looks amazing. That's one fancy pan you have there! I know, I did think twice before buying it, but then I thought the regret would be too much to bear if I didn't! Mr P, it's gorgeous. And I love your reasoning on the no-pumpkin thing! I just posted my Steamed Pumpkin Pudding, something you might like (or else I wouldn't have mentioned it!). What's not to love about pumpkin, and yet I actually know a few people who don't like it. Peter, just wanted to pop back in and tell you I'm doing a kitchen tools giveaway this week and, for once, the giveaway is open to readers everywhere, not just the US.